This train cake is one of the cakes featured in the Creative Cakes Do It Yourself Book and although this train cake is aimed at little boys especially because of the sweety filled coaches, it can be adapted to be a train cake that will wow even a youing man turning 21 (I made a black and silver train with 21 coaches that looked really stunning, each coach featured a milestone covered representing each year of his life. A train in the colors of the country's flag featuring a separate coach for each different politician got aptly named "the gravy train) and went down very well. 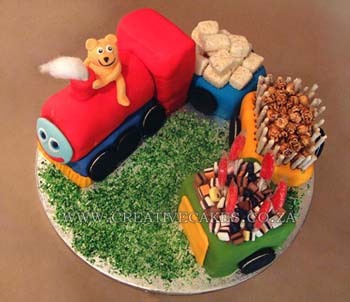 Train cakes can be a wow for people of all ages.